The advent of virtual reality has now turned into something that is not only limited to entertainment, instead, over the years, constant advancements in this technology has also worked to shape the future of architectural design. The application of virtual reality began in the domain of presenting projects upon completion but that now shifted towards the use of architectural visualization VR technology. For most of the top architectural visualization firms, the main issue has always been to come up with visualization techniques that serve to be better visual representations than both 2D and 3D but that has been made possible with virtual reality. The potential virtual reality technology holds for designers, architects, and any architectural visualization studio is far greater than one can even imagine. Even if you are drafting an initial design plan to make edits in already-made building designs, so much has become possible due to the emergence of virtual reality. The upsurge in individuals and companies looking for virtual reality services justifies the popularity of this technology. Using a virtual representation, it becomes easier to convince the client about the building’s design, its features and how the entire design works. In a matter of minutes, the client is able to give relevant feedback and no time is wasted. Looking into the bigger picture, 3D renderings and models are still effective but at times these techniques fall short in displaying certain design specifications. 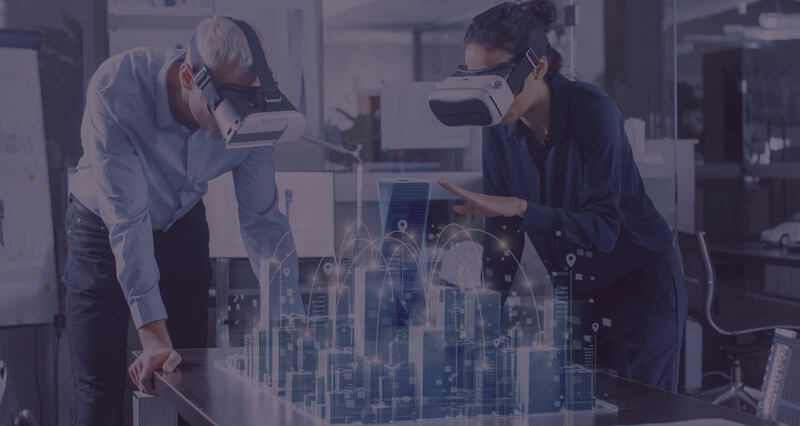 To overcome this dilemma, VR has been brought to the architectural industry and its application has transformed the 3D world into a full-fledged interactive yet 3D environment. The notion of bringing architectural aspects related to interior and exterior design comes with several benefits. Here are some of the core benefits of using a virtual environment. Taking a certain client into the virtual realm results in a visually comprehensive outlook on the building’s design, interior, exterior and all the facilities that are present in it. This notion helps the client in making a firmer decision or providing feedback on the architectural design instead of resorting to a blueprint. A realistic view of the design helps people understand the specifications and visual elements better. The use of 3D models still prevails in the architectural industry but more and more people and businesses are resorting to virtual reality services. For that reason, designers and architects no longer have to spend time correcting minor details nor do they have to spend time waiting for client feedback. Supposedly, a client is looking to make a purchase in real-estate and there are two available options. One is to opt for 3D rendering and the other is an architectural visualization vray. What would be the client’s prime preference? It would certainly be the virtual reality experience. The answer is to always stay ahead of the competition. Many architects and designers would be using traditional 3D techniques but if you highlight your artistic potential with a virtual representation, then surely you would gain far more recognition amidst the competitors in the industry. It is surely a given that virtual reality services have transformed the architectural design industry. In order to visualize a specific architectural design, it is essential to keep the aspects of real-world navigation into consideration. Solely with 3D visuals or a blueprint, one cannot visualize routes or pathways of a building. Here is where the application of virtual reality is required. You do not only view the routes and scenarios in a VR environment but you also are able to react to your surroundings. Supposedly, there are emergency that exist in the design model. The client would be able to understand and experience the routes by being able to visually connect to the VR representation.